Christian and Amber are a Canadian couple who moved to Girona 10 years ago. Christian was a professional cyclist, and while travelling around the world, he discovered his love for coffee. Soon after they decided to open a café in Girona: La Fabrica, now a popular place in the city and well-known for offering quality and unique experiences. People from Australia and North America, in particular, are delighted to find coffee like in their own countries. 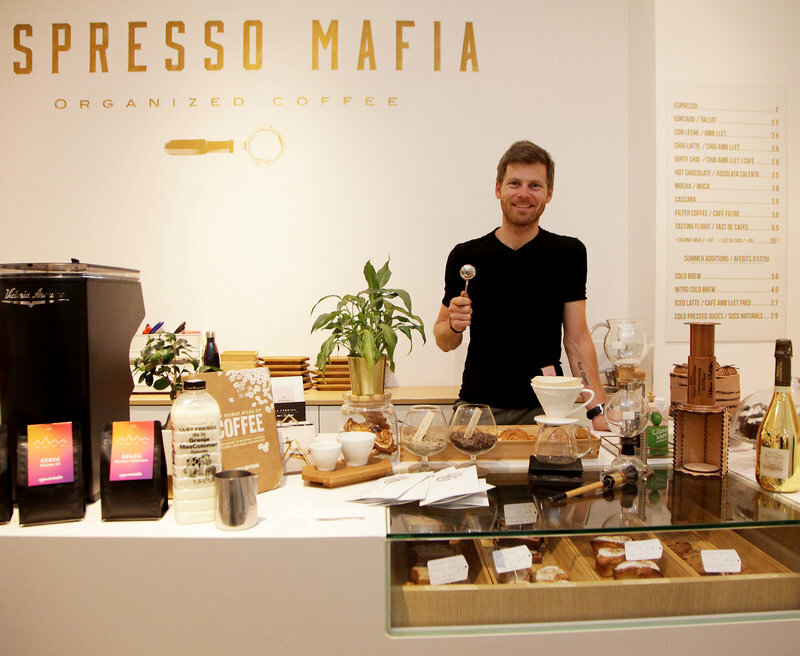 They had so many people every day that they decided to expand and so they opened Espresso Mafia, the only place in Girona that roasts fresh coffee. They have also expanded internationally and export their roasted coffee to Jakarta, Portland and Vienna. Christian shares the objects that are important in his business with us. 1. Coffee. We use freshly roasted coffee, we source the bean green and roast them in house. Our varieties come from Kenya, Nicaragua, Guatemala...We use 18 grammes for each coffee, compared with other bars, which use seven grammes. It’s the same amount of caffeine but allows the flavours of the coffee to come out more. Our coffee is fair trade, direct trade and organic, we track the coffee and work directly with farmers. 2. Milk. Fresh milk delivered to us every morning from the Mas Colomer farm in Esponellà, who we have worked with since day one. We only use full fat milk, 3.5%. 3. Milk jug. Without a handle, to do latte art as I like. Each barista has his or her own style, and we like playing with different designs. 4. Coffee Grounds book. All I know about coffee is due to reading and practicing. We provide Espresso Mafia with a range of books so that the people coming can read and learn and expand their knowledge on coffee. 5. Cup. Our signature, inspired by the ancient Japanese tradition of tea, it is handleless too, to enjoy coffee better while wrapping one’s hands around the hot cup. It’s made and printed with our logo locally in La Bisbal. 6. Coffee samples. For coffee cupping, we try many different samples of coffee from farmers all over the world to choose the ones we roast for you. These are from Brazil, Ethiopia and Peru. 7. Tasting spoon. Special cupping spoon used to try different coffees. It’s like a soup spoon, when you sip it you get all the flavour of the coffee. 8. Aeropress Trophy. A trophy we won in the Spain Aeropress championship two years ago. 9. Cava. A gift from our friends when we opened Espresso Mafia, a gold cava like everything in Espresso Mafia. Our style is gold, white and wood, inspired by Japan, minimalist and relaxing, just focused on coffee. 10. Siphon: A present from my wife from Portugal. It’s a filter heated by a flame which infuses the coffee and you don’t need electricity, it makes it on the spot. I like to use it as it’s a way of going back to tradition.